Did you know that an estimated 61.5 million Americans suffer from some type of emotional or mental disability? Extreme stress, depression, bipolar disorder, and post-traumatic stress disorder are just some of the issues impacting some people’s lives. While they may be helped with therapy, medication, or a combination of the two, there are some with emotional disorders who can also benefit from the companionship of a pet. Emotional Support Animals are those pets that are designated by a mental health professional as essential to their owner’s mental health and benefit from several concessions in housing units and on airlines. If you have an emotional disorder and want to find out more about emotional support pets, here is what you need to know. Emotional Support Animals are different from service animals, which are required to have specialized training and/or experience in order to help their owners. Emotional Support Animals, according to the U.S. Department of Housing and Urban Development, may sometimes perform tasks that require training but others provide assistance that requires no training. Any type of animal can be used as an Emotional Support Animal as long as they are providing the comfort and support their owner needs to treat their condition. Dogs and cats are very common ESAs, but others have used pigs, birds, hedgehogs, or even miniature horses as emotional service animals. What Laws Are Related to Emotional Support Animals? When you have a pet that has been certified by a mental health professional as an ESA, you will benefit from concessions in two laws: the Air Carrier Access Act and the Fair Housing Act. If you are considering going through the process of getting an ESA letter for your pet, you should be aware of how these laws will apply to you. If you do not have an ESA letter and want to take your pet on an aircraft, you will be charged extra to have your pet in the cabin with you or your pet will be required to ride in the cargo hold. Under the Air Carrier Access Act, if you have an ESA letter for your pet, the airline cannot prevent you from keeping your pet in the cabin, require advance notice to allow you to keep your pet in the cabin, or charge you extra for this benefit. The Fair Housing Act requires that landlords make reasonable accommodations for those with Emotional Support Animals even in housing communities that restrict pets. A resident who is in possession of a valid ESA letter cannot be denied housing because they have a pet unless that resident is neglecting the pet or the pet is doing significant damage to the housing unit. To get these benefits for your Emotional Support Animal, you must have an ESA letter that meets all the requirements of the Americans with Disabilities Act. You may get one of these letters either by meeting with a qualified mental health professional in person or you may be referred to one through a valid online service that helps connect you with a therapist who can write you an ESA letter. How Do I Get a Valid ESA Letter? Valid ESA letters must be issued by a licensed mental health professional such as a psychologist, therapist, licensed clinical social worker, or psychiatrist. Many of these professionals will either require that you are a patient of theirs undergoing therapy or, if the process is done online, they will go through your medical records and interview you to determine your need for an ESA. Some of the qualifying conditions to get an ESA letter are depression, anxiety, panic disorder or panic attacks, personality disorders such as borderline or bipolar disorder, fears or phobias, social anxiety disorder, or post-traumatic stress disorder. With your certified ESA letter, you will be recognized as a patient or a patient on a case-by-case basis under the care of a licensed mental health professional for emotional or mental disabilities. The letter also verifies that your disability significantly limits your daily life and affects your ability to perform everyday tasks. Finally, the letter will state the need for your emotional support animal as a necessary part of your therapy. Do I Need to Get My ESA Certified? Certification for an Emotional Support Animal is not only unnecessary, but it is technically impossible. There is no recognized registry for ESAs and ‘registering’ your animal will not give it any special privileges. To designate your pet as an Emotional Support Animal, you need only get a valid ESA letter from a licensed mental health professional. If you are working with a company that says they sell registered Emotional Support Animals or official ESA certifications, you are likely being scammed. Yes, you can get an ESA letter online from an online company. However, you must be careful and look out for red flags that would indicate the service is not legitimate. The online company must connect you with a licensed mental health professional as that is the only valid way to get an ESA letter. If the service offers to ‘instantly’ approve you or tells you that your letter will be cheaper than other services, you are probably not working with a legitimate company. Can I Buy an Emotional Support Dog or Other Animal? No. Owners of animals are certified with ESA letters, not the pets themselves. If you see any ‘registered’ or ‘licensed’ Emotional Support Animals for sale, those who are selling them are not legitimate. Only those with valid mental or emotional disabilities can be approved to have an ESA and that approval can only come from a licensed mental health professional who has evaluated and/or treated you for your condition. What Type of Animals Make the Best ESAs? This is a question without an easy answer because those with emotional or mental health disorders get support from different types of animals. In many cases, the ideal ESA will be the pet you already own. If you have a dog, cat, bird, guinea pig, or any other animal that gives you comfort and helps you manage your symptoms, you have the right Emotional Support Animal. If you have a mental or emotional disorder and do not currently have a pet but think one might help you, your best bet is to go to a shelter. Spend some time with the dogs, cats, or other animals at the shelter and see which one offers you the most comfort. In many cases, dogs or cats make excellent ESAs because of their naturally loving temperaments, ability to be in the home, and because they do not need the specialized care that a more exotic pet would require. What is the Difference Between Emotional Support Animals and Service Animals? Service animals and Emotional Support Animals are not the same. Service animals must be specially trained to perform duties for their owners. In many cases, the owners of service animals are physically disabled. Service animals can be trained to assist those who are blind or deaf or who are in wheelchairs or who experience debilitating mental disorders. Service animals are allowed by law into any private establishment while Emotional Support Animals are not. It is much more difficult and expensive to obtain a service animal as they must fit certain training criteria before they can qualify. Some service dogs perform psychiatric services for those with severe emotional or mental health issues while others perform more physical tasks for those who are hearing, seeing, or otherwise physically impaired. Because they perform crucial services for those with disabilities, service dogs have much more public accommodation than their ESA counterparts. What is the Difference Between Emotional Support Animals and Therapy Dogs? Emotional Support Animals provide valuable support and comfort by simply acting as a companion to their owners. Because they have one owner and can be with their owner at all times, the bond between owner and ESA can grow very strong. In contrast, therapy dogs are not usually owned by the people they provide treatment too. Therapy dogs are usually brought into hospitals, nursing homes, or other facilities where treatment is being given to individuals with emotional or physical ailments to provide comfort. Service dogs may also be used in areas where a disaster, such as an earthquake or bombing, has occurred to provide support and comfort to survivors. Because they are not technically considered ESAs or service animals, they are normally not given the same accommodations as either group of animals. Owners of ESAs must be careful never to misrepresent their animal as either a service dog or a therapy dog and must respect the laws that govern their pet. If you are currently seeing a mental health professional for an emotional or mental disorder, it’s likely that your doctor is already aware of the many benefits of Emotional Support Animals. More than likely, if you bring up the possibility of obtaining one, he or she will be more than happy to issue you a verified letter. If you are not currently seeing a mental health professional, you can still obtain a verified ESA letter. There are numerous online services that will provide you with a connection to a mental health professional who can go through your health records, evaluate you, and determine if you qualify for an ESA. If so, they can provide the verified letter that you will need for your pet to receive ESA benefits. 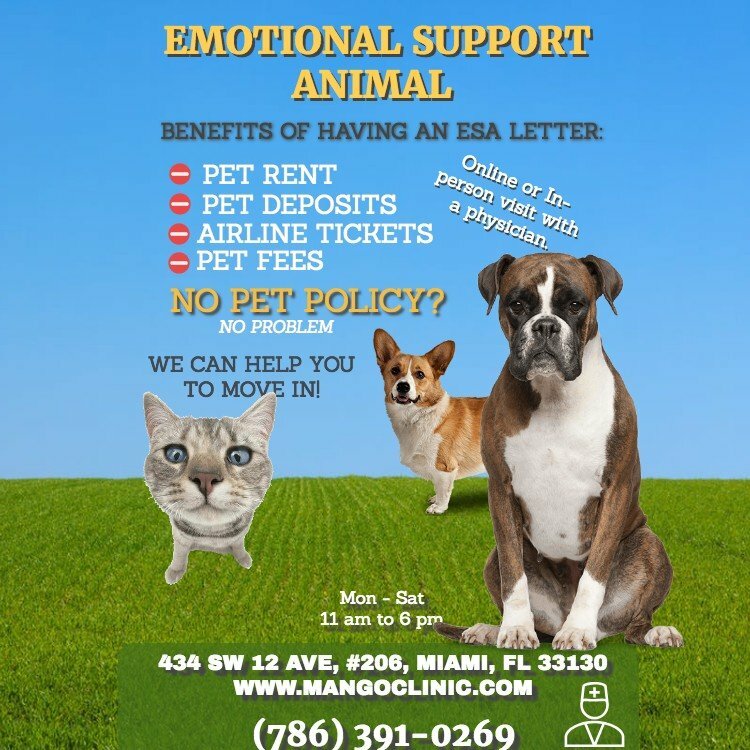 Here at Mango Clinic in Miami we can help you legally obtain your ESA letter, in person or online. 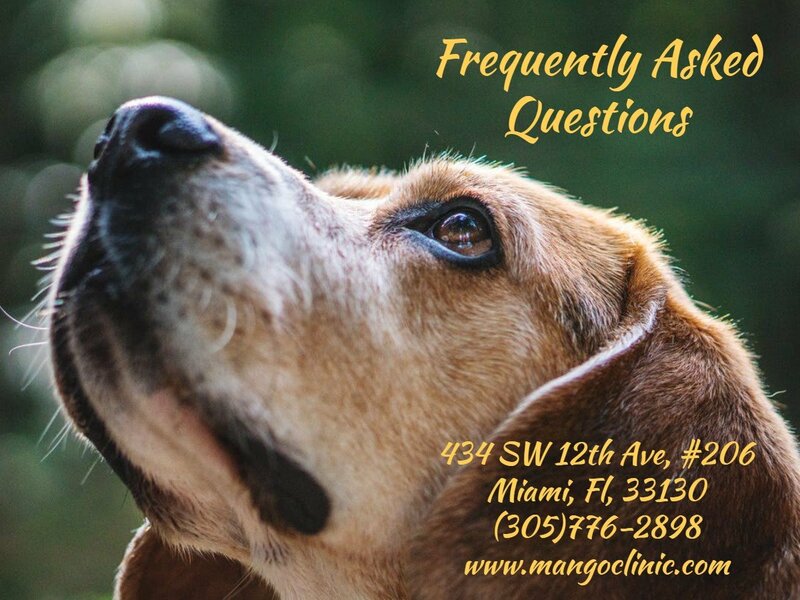 Call us (786) 391-0269 or schedule an appointment online to speak to a licensed Board Certified Physician. Where Can My ESA Live with Me? With your verified ESA letter, your Emotional Support Animal can live with you in housing units, homes, condos, dormitories, or any other form of public housing. All of these facilities are included in the Fair Housing Act to accommodate you as a resident or student.